The largest of these looks set to be Aontu, who have said they will name fifty candidates to contest local elections across both parts of Ireland. Aontu is headed by Meath-based TD Peadar Toibin who is one of those who left Sinn Fein in November over the party’s change to its policy on abortion. Since then he has been working to build a party machine across all 32 counties, setting up 60 new party Cumainn [branches] with the goal of ‘fixing’ a ‘broken’ political system. 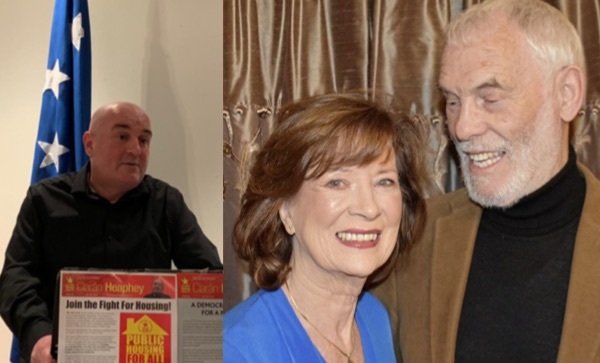 Aontu’s best prospects may be north of the border, where prominent husband and wife team Francie and Anne Brolly (pictured, right) are set to make a return to electoral politics. A former republican internee, Mr Brolly was a Sinn Fein councillor and then a Stormont Assembly member for East Derry from 2003 to 2009. In 2005, he endured a wrongful arrest by the PSNI police. At the time, Sinn Fein’s Martin McGuinness described it as one as ‘one of the most blatant examples of political policing seen here in recent times’. Mrs Brolly served on Limavady council for Sinn Fein from 2001 to 2014. Both are well known on the music scene across Ireland, and their son Joe is also a high-profile Gaelic games pundit with RTE. Mrs Brolly said she and her husband felt there is work yet to be done in Irish politics. “The reason we decided to go at this stage is that we passionately believe in life, unity and economic justice and have been involved in community affairs all our lives,” she said. The couple recently helped launch an Aontu cumann in Dungiven, named after Protestant republican Henry Joy McCracken. “We were inspired by the United Irishmen, founded in Belfast in 1791, who sought the unity of the Irish people, Protestant, Catholic and dissenter,” she said. Socialist republican party Eirigi -- officially ‘Eirigi For a New Republic’ -- has named three candidates in Dublin: Damien Farrell in South West Inner City Dublin, Ciaran Heaphey in Artane/Whitehall and party chair Brian Leeson in Dundrum. Speaking at his recent launch in Coolock, Mr Heaphey (pictured, left) said the establishment political parties had neglected Dublin’s north-east. Republican Sinn Fein is contesting the elections with party treasurer and Irish language activist Diarmuid Mac Dubhghlais in Ballymun-Finglas, while veteran Tomas O Curraoin is looking to retain his seat in the County Galway ward of Conamara South. Despite suffering a major setback in October’s Presidential election, Sinn Fein looks set to field its largest ever number of candidates in the 26 Counties, with roughly 200 candidates already named to build on the 120 council seats it still holds out of the 140 it won in 2014. In the Six Counties, Sinn Fein is contesting in the unionist stronghold of Bangor for the first time, as well as putting forward an extraordinary six candidates for the seven council seats in the Black Mountain electoral area, in their own power base of west Belfast. A number of independent republicans are also set to be candidates. A full list will be published here before the elections take place on May 2 in the Six Counties and May 24 in the 26 Counties.